It’s time to raid your grandmother’s jewellery box because this antique favourite is set for a comeback big time. Found in the ochre red dirt of Australia’s outback, this gemstone is quickly climbing the must-have ladder when it comes to choice of bling. Dior kick-started the revival in 2004 with Victoire de Castellane’s nature-inspired collection that featured the Lunae Lumen Holly Colorum – a midnight-blue snake curled around a dark opal. Dior’s current timepiece collections also feature opals, much like Cartier with their High Jewelery Secret Hour watch. Tiffany and Co. followed suit, featuring Australian opals in three of its pieces for the 2015 Blue Book including a necklace with a 5.9-carat oval black opal. The jewellery brand also features the stone in its current collection with a pink opal pendant. Of course, once the big fashion houses welcomed the unique stone into their repertoire, other brands have followed suit. 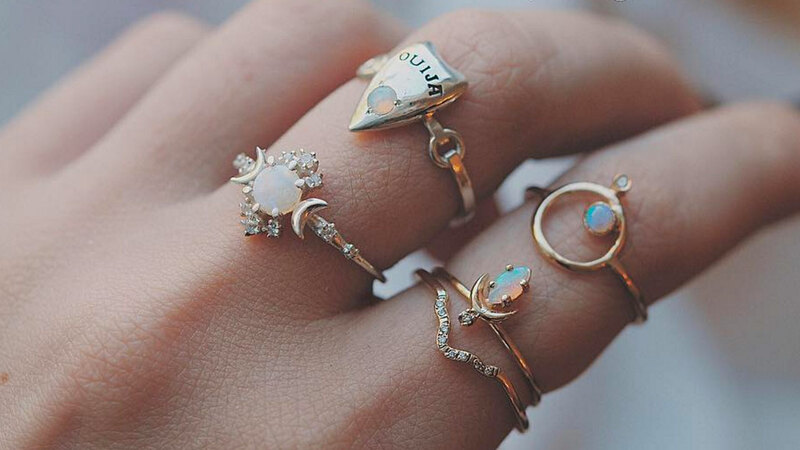 No longer something saved for just special occasions, these brands have transformed opals into pieces that will fit seamlessly into your everyday collection. Melanie Kamsler and Tamila Purvis are the duo behind ubiquitous label Mania Mania. Their pieces are symbolic and abounding with modern mysticism and crafted from gold, gemstones (opals included) and ethically sourced diamonds. This beautiful fine jewellery brand is helmed by Sofia Ajram in her Montreal studio. With a love for the beauty and mystique of outer space, Morphe Jewelry pieces are uniquely imbued ith a magical charm. Each piece has a background narrative of its own and is truly unique. Fledgling label James and Irisa is already making waves, with textural, modern pieces born from a passion for the Australian opal. The partner team behind the self-titled label say their love for the precious gem was the catalyst for launching their label that heralds the stone like no other.